Vivo V15 Pro appears to be the company’s next smartphone model to sport a pop-up selfie camera after the Nex series handsets, as per the latest alleged leaked images surfaced on the Web. The smartphone, which is speculated as the successor to the Vivo V11 Pro ₹ 22,990, is also said to have a triple rear camera setup. Vivo notably launched the V11 Pro as its affordable phone sporting an in-display fingerprint sensor. There was also a waterdrop-style notch to have room for the selfie camera. The smartphone arrived in India back in September last year. The images showing a purported Vivo V15 Pro case, as spotted by a Twitter user with pseudonym I_Leak_VN, reveals the design of the unannounced smartphone. There is a cutout on the top side to hint at the presence of a pop-up selfie camera — just like what was featured on the Vivo Nex ₹ 33,970. The new handset isn’t likely to be as pricey as the Vivo Nex, though. Also, there is a cutout for the 3.5mm headphone jack. The leaked case at the back side shows a giant cutout that could be pertaining to the triple rear camera setup. In contrast, the V11 Pro debuted last year with a dual rear camera setup. Vivo is also likely to retain the in-display fingerprint sensor as the case doesn’t have a hole at the back for the fingerprint reader. On the right side, the V15 Pro appears to have a power/ lock key, whereas the left side sports a volume rocker. 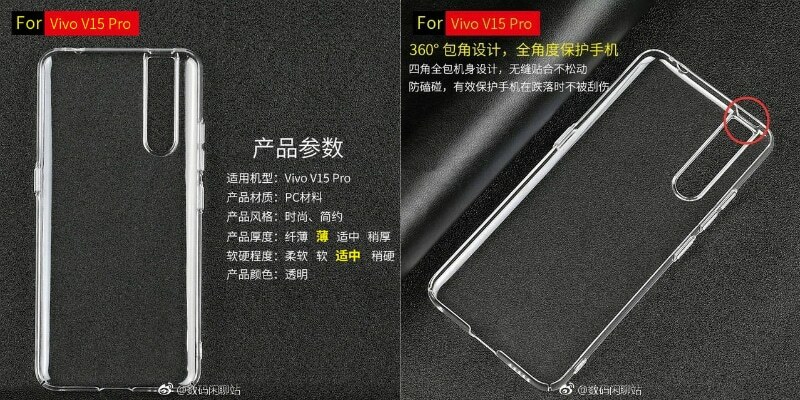 The Vivo V11 Pro was previously rumoured to get the V13 Pro as a successor. However, considering the fresh revelation, the V15 Pro appears to be all set to replace the smartphone that entered India with a price tag of Rs. 25,990.